This question is really three separate questions. The first question is about when it is time to even consider spraying for mosquitoes. What type of property or situation warrants spraying for mosquitoes? The second question is about time of year. 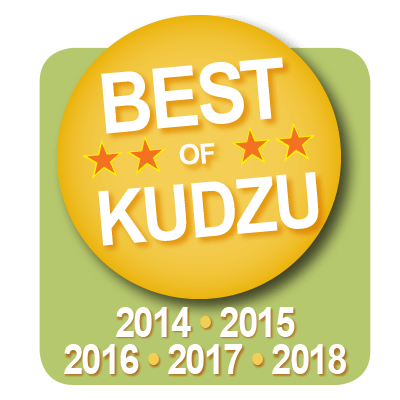 When is mosquito season and when should I begin mosquito control measures? The third question is more specific. What is the best time of day to spray? To answer these questions about the right time to spray for mosquitoes, you will need some basic knowledge about mosquitoes and their behaviors. Before you start thinking about spraying around your home for mosquitoes, you should consider a few things. The first thing to consider is whether you have a need to spray at all. In Georgia the answer is pretty clear. Almost every part of Georgia is home to a significant population of mosquitoes during the warmer months. However, there are some factors that could make your local population even larger. But there is no escaping mosquitoes altogether. There are many factors that affect the size of a local mosquito population. One of the biggest factors is the presence of standing water. Most mosquitoes choose to lay their eggs in standing water. Unfortunately, it doesn’t take much water. The amount of water you could pour into the cap of a soda bottle is enough for mosquitoes. That same amount of water could be present in a depression in lawn furniture, a concave lawn ornament, outdoor children’s toys, or even a fallen leaf. Standing or slow moving water is vital to mosquito populations and reproduction. So proximity to water is a big indicator for mosquito populations and the need for mosquito control. If your home backs up onto a pond or slow moving creek, you mosquito population is probably well above average. Even if you don’t have a natural source of water, water features in your garden could also host mosquitoes. A bird bath, fountain, or artificial pond can be a haven for mosquito eggs. If you have any kind of water in your garden or yard, you should expect to see more mosquitoes. Other factors in mosquito population have more to do with the adult mosquitoes. Adult mosquitoes like to hide out in tall grass and bushes during the daytime. When they are less active, the presence of tall grass, bushes, or low hanging shade trees provides excellent shelter. If your property back up onto woods, a field, or even just an area overgrown with bushes, you are likely to see a spike in mosquito activity. The same is true of your property itself. That same lovely garden that makes a great place to relax on a spring day is also a great place for mosquitoes. Just like humans, mosquitoes love a nice shade tree. If the tree has low hanging branches, they can be a perfect spot for mosquitoes to spend their less active hours. So if your property includes slow moving or standing water, it’s time to think about mosquito control. If you have tall grass, large bushes, or low trees, it is also time to think about mosquito control. The same is true of the areas adjacent to your property. Tall grass, large bushes, and low trees all call for extra mosquito control. Of course, in Georgia it doesn’t take this specialized environment to become a haven for mosquitoes. Our mild winter, early spring, and late end to summer mean that we are great mosquito hosts. There is really nowhere you can go in Georgia that doesn’t get mosquito activity during some part of the year. It’s always a good idea to start spraying for mosquitoes just before the season starts. The goal is to get ahead of the breeding mosquitoes that could swarm in your yard. It’s best to lay down a layer of insecticide that will prevent mosquitoes from forming a significant population. Knowing when mosquitoes are likely to appear makes all the difference. It can be the difference between fighting a proactive or merely defensive battle against these summer loving pests. 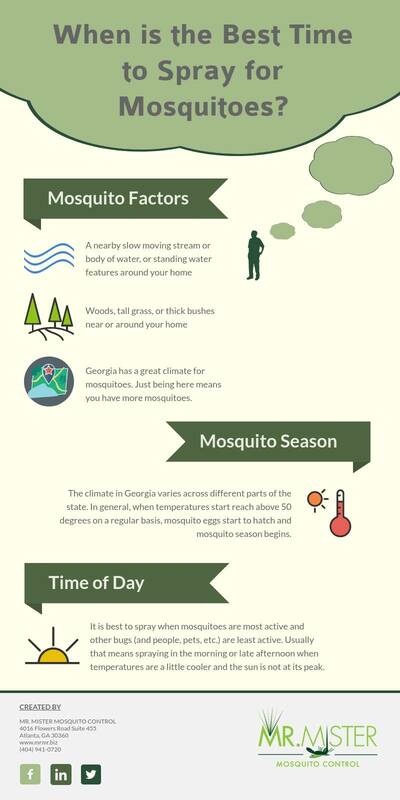 The actual beginning of mosquito season in Georgia varies. Mosquitoes often lay eggs well before spring, even before winter settles in. But those eggs do not hatch right away. Mosquito eggs know when to begin to develop into larvae based on the temperature around them. When the temperature reaches 50 degrees on a regular basis, mosquito eggs begin to develop. When exactly this happens varies from year to year It also varies by region. Atlanta is generally divided into three or four regions. The lowest and warmest region is the Lower Coastal Plain. Slightly farther north and inland lies the Upper Coastal Plain. In both of these regions, mosquitoes may begin to develop as early as early March. The weather is, of course, the greatest factor. That’s why the beginning of mosquito season can vary from year to year. Farther north than the upper coastal plain is the Piedmont. This area includes all of Metro Atlanta. Compared to the Coastal Plain, the Piedmont has a less warm and more moderate climate. Here mosquito season can begin in early March in a warm year. But it can also be delayed until as late as late March or even early April. The northernmost region of Georgia is also the one at the highest elevation. The Blue Ridge includes the southern tip of the Appalachian mountain range. Due to its elevation, it sees much cooler weather than the rest of Georgia. However, the summer months still see a hot and humid weather pattern. In this region mosquito season will start the latest. The Blue Ridge often sees a start to mosquito season in late March. The difference between mosquito season start times is all due to average temperatures. Warmer years see an earlier mosquito season. Colder years see the start of mosquito delayed somewhat. The final piece of the question “when is it time to spray for mosquitoes” is to determine the best time of day to spray. Mr. Mister pest control technicians stay busy all day spraying for mosquitoes. As busy mosquito control experts, we make a point of seeing all of our clients about every 21 days. Doing this requires a full time schedule. However, if you are going to be spraying yourself, there are some options for better times than others. In general, you want to spray when the mosquitoes are most active. It is also good to try to spray when other inhabitants, adults, children, and dogs, are least active. Make sure other inhabitants spend the least time possible in the affected area immediately after spraying. The EPA has rated most mosquito control agents as safe to use when used properly. However, misuse or prolonged repeated exposure could be hazardous. If you have any questions, don’t use chemical mosquito sprays without a professional. Instead, hire a trustworthy mosquito control company like Mr. Mister Mosquito Control. Our technicians will do a free inspection of your property. After the inspection they will be able to pinpoint areas of concern. Together with the Mr. Mister inspector, you can begin to create a plan for integrated pest management (IPM). This program will include spraying and other preventive measures. To stay on top of your mosquito population, you will need to have a plan in place before the start of mosquito season. One of the best ways to do this is to work with Mr. Mister to provide a great service at a great price. Mr. Mister has a 21 day guarantee. Approximately every 21 days, a technician will come to your home to spray. The technician doesn’t need to enter your home, so if you just leave all gates unlocked a technician should be able to do her or her job without ever coming in your home or even disturbing you. So go ahead and get your free appraisal today. We are happy to find a tailored plan that is right for your home.